The Centers for Disease Control and Prevention (CDC) reports that stroke kills someone every four minutes. It’s also the leading cause of serious long-term disability in the United States. Equally important is recognizing that stroke can occur at any age, and people should not wait for symptoms or signs, which include slurred speech, blurred vision, and weakness or numbness on one side of the body, to subside or intensify before calling 911. Stroke is a medical emergency no matter how small the signs or symptoms may seem. Simply speaking, stroke is a brain attack. The majority of strokes are ischemic, caused by a blocked blood vessel in the brain that cuts oxygen supply resulting in a neurological deficit. 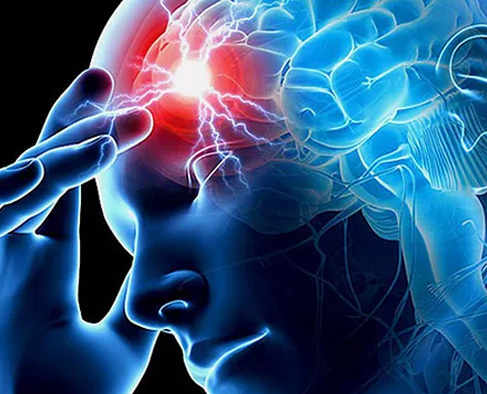 Ischemic stroke can often be treated with the clot-dissolving drug tPA or other advanced interventions when treatment is sought at the earliest signs of stroke. Less common is hemorrhagic stroke in which a blood vessel ruptures causing bleeding into or around the brain. According to the National Stroke Association, 2 million brain cells die for every minute of stroke, increasing a patient’s chances every 60 seconds for suffering permanent, life-changing disabilities. Because stroke treatment is time-dependent, medical experts throughout the continuum of care advocate 911 as the best line of defense against possible long-term disability, or death, due to stroke. Engaging the 911 EMS system initiates patient care and alerts the hospital care team. Treatment administered within the “Golden Hour,” or first 60 minutes, of stroke symptoms onset regularly leads to better patient outcomes, including few to no lasting deficits. For the majority of ischemic stroke patients, the treatment window for the brain-saving tPA drug is only three hours. Patients who receive tPA within 60–90 minutes of stroke symptoms onset have the best possible chance for full recovery. According to medical data, the benefits of tPA are halved for every 90-minute delay in seeking medical treatment. When a 911 call is received, emergency dispatchers follow medically-approved protocols to determine what type of emergency response the patient may require. Dispatchers alert emergency responders, including ambulance paramedics, of a possible stroke patient based on the caller’s answers to specific questions. Like 911 dispatch, paramedics in Santa Clara County follow prescribed EMS protocols to assess signs of stroke. The thorough assessment helps the on-scene paramedics determine if patients meet the criteria for stroke activation and ambulance transport. 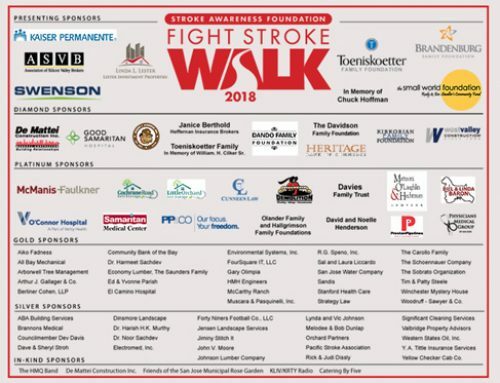 By mandate, stroke patients that are transported by ambulance in Santa Clara County are taken to a certified primary or comprehensive stroke center. Every hospital in Santa Clara County is a certified primary stroke center and is equipped to administer the clot-dissolving drug tPA. Stanford Hospital, Good Samaritan Hospital, Regional Medical Center, and El Camino Hospital are further certified as comprehensive stroke centers. In addition to meeting certified primary stroke center requirements, these hospitals feature a neuro-intensive care unit and 24/7 neuro-critical care team for treating complex stroke cases. Dr. Henry Huie, chief of Brain Injury Rehabilitation at Santa Clara Valley Medical Center, echoes Cudlip’s urging to use 911. “Early recognition of stroke symptoms can influence someone’s treatment options and lead to a better recovery. Certain treatments are time-limited so calling 911 and getting to a hospital rapidly is important,” says Dr. Huie. While some stroke patients who receive early interventions suffer no deficits, it’s not uncommon for stroke survivors to need some level of rehabilitation. 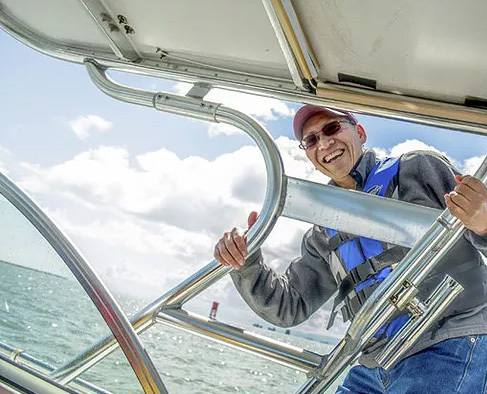 “During inpatient rehabilitation, we often see that patients who were treated early with tPA or thrombectomy can have a faster recovery and more functional independence at discharge,” says Dr. Huie. Know the signs of stroke and call 911 immediately. Time is brain. 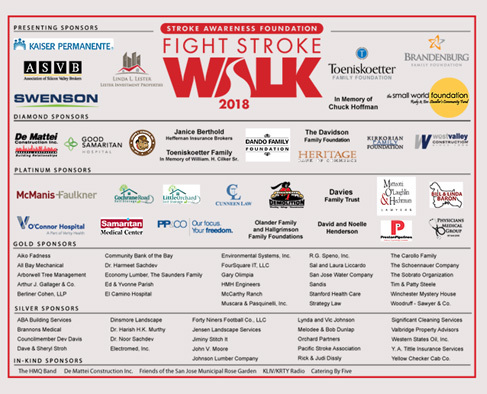 Thank you 2018 Fight Stroke Walk Sponsors!